Rapid development of endoscopic technologies is bringing medical professionals closer to point-of-care pathology than ever before. The goal is to allow physicians to identify diseased or cancerous tissue in situ and reduce or eliminate the need to biopsy tissue for examination by surgical pathologists. Researchers at Rice University in Houston are developing a high-resolution microendoscope (HRME) that offers the ability to view tissue at a subcellular level. 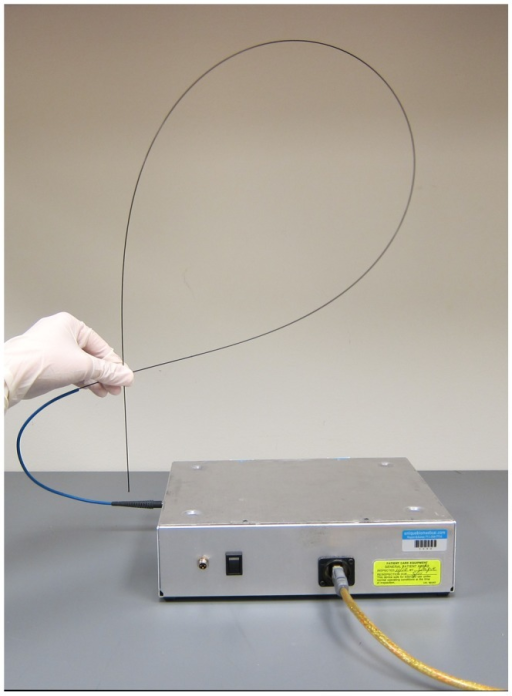 This fiber optic probe would reduce the need to collect the biopsy that is typically sent to anatomic pathologists for analysis. Measuring 1-mm in diameter, the probe works using the existing accessory channel of the endoscope. Touching it to the surface of the tissue provides real-time in vivo images to the technician at up to 12 frames per second on an accompanying tablet display. Images are enhanced using visual overlays and an algorithm that highlights the nuclei of cells within the field of view. The HRME system is battery powered and fits in a briefcase for easy transport. In a 2015 study published in Gastroenterology, Rice University researchers found that, when paired with Lugol’s chromoendoscopy (LCE), the HRME provided a per-biopsy specificity of 88% and a per-patient specificity of 79% for detecting esophageal squamous cell neoplasia (ESCN)—nearly doubling the specificity of LCE alone. The results of the study indicate that new developments in endoscopy, including increased accuracy and decreased cost, might challenge this standard practice. For example, one finding of the study is that, compared to LCE observation alone, the use of LCE with HRME would have eliminated the need for 136 biopsies. Also, about 55 of the study’s 147 patients would not have needed a biopsy at all. Over the past four years, Dark Daily has covered developments in the changing relationship between traditional imaging technologies and pathologists. In 2012, we reported on the ability of probe-based Confocal Laser Endomicroscopy (pCLE) to reduce overall biopsy rates in the detection of certain gastrointestinal cancers. The Rice University study claims that HRME offers similar diagnostic accuracy when compared to CLE at a fraction of the price. Based on the findings of the study, the authors conclude, “HRME may be a cost-effective optical biopsy adjunct to LCE, potentially reducing unnecessary biopsies and facilitating real-time decision making in globally underserved regions.” In many situations, the cost of a biopsy exceeds those of endoscopy. There also is the time required for the pathology lab to review the sample and provide results. While high-definition optical technologies and improvements in computational lab software have already offered new options to both medical professionals and clinical laboratories, biopsies still add a considerable delay from the time of discovery until diagnosis. Ultimately, developing nations or rural facilities might be the biggest beneficiaries of these emerging technologies. The low cost, high specificity, and simpler learning curve of HRME would be important in these settings. That is because ESCN and other cancers are particularly prevalent in regions with limited access to funding, infrastructure, and trained medical professionals. In most developing countries, there is a recognized shortage of well-trained histopathologists. Thus, technologies like Rice University’s high-resolution microendoscope would make it possible for endoscopists to analyze tissues in situ at the time of the procedure—thus reducing the number of biopsies that would otherwise be needed. Not only would this improve patient care, but it would also reduce the time required to diagnose and treat conditions.